The Best Rheumatoid Arthritis blogs from thousands of top Rheumatoid Arthritis blogs in our index using search and social metrics. Data will be refreshed once a week. About Blog RA Daily Blog, Experts & Community. RA patient resources including symptoms, diagnosis, treatment, community, expert answers and daily articles. Facebook fans 110,633. Twitter followers 2,855. Facebook fans 21,031. Twitter followers 473. Facebook fans 650,802. Twitter followers 959,528. About Blog Latest Rheumatoid Arthritis News and Research from around the world. Facebook fans 266,781. Twitter followers 11,552. About Blog Stories and information about Rheumatoid Arthritis. The Mighty is a site where people share their personal experiences with disability, disease and mental illness. Facebook fans 800,763. Twitter followers 40,173. Facebook fans 1,184,846. Twitter followers 542,309. Facebook fans 3,283. Twitter followers 1,159. Atlanta, GA About Blog Just another Arthritis Foundation Blog Sites site.Get the latest information on arthritis news, patient stories, diet tips and much more. Facebook fans 192,599. Twitter followers 33,802. About Blog Learn about Rheumatoid Arthritis pain management, symptoms, causes and treatments. Facebook fans 6,619,971. Twitter followers 3,455,945. Boston, MA About Blog The Rheumatoid Arthritis page contains articles and information from the New England Journal of Medicine.The New England Journal of Medicine (NEJM) is a weekly general medical journal that publishes new medical research and review articles, and editorial opinion on a wide variety of topics of importance to biomedical science and clinical practice. Facebook fans 1,529,809. Twitter followers 434,355. New York City, NY About Blog Bringing arthritis to its knees since 1999. Facebook fans 112,160. Twitter followers 9,411. Facebook fans 56,227. Twitter followers 9,407. Facebook fans 394. Twitter followers 694. USA About Blog The Rheumatoid Patient Foundation (RPF) is dedicated to improving the lives of patients with Rheumatoid diseases such as Rheumatoid Arthritis and Juvenile Arthritis through a variety of means, including research, public awareness, patient education and patient-led advocacy. Facebook fans 14,163. Twitter followers 2,176. About Blog Ashley Boynes-Shuck is a published author and health advocate who is living with several chronic conditions, including RA, celiac disease, and lupus.Her blog posts tackle different issues faced by people living with chronic illness, offering advice and information. Facebook fans 6,631. Twitter followers 8,968. Facebook fans 1,928. Twitter followers 326. Northern California, USA About Blog RheumaBlog is all about rheumatoid arthritis: living with it, coping with it, laughing at it, and offering encouragement to everyone who has it. Facebook fans 576. Twitter followers 2,538. Kentuckiana About Blog One woman's journey to learn to live life from a place of gratitude while fighting Rheumatoid Arthritis. Facebook fans n/a. Twitter followers 1,409. 23. From This Point Forward. About Blog Blog has been a very honest record of how Mariah have adjusted to life with RA by always trying to look forward. Facebook fans 544. Twitter followers 1,412. Indiana, USA About Blog Welcome! Follow along my rheumatoid arthritis journey by reading about my personal experiences. Rheumatoid arthritis is a life-changing disease, but it is possible to have a chronic disease and still live a good life! Read about tips, tricks, and the experiences I have gathered along the way. Facebook fans 9. Twitter followers 2. Facebook fans 211. Twitter followers 990. Minneapolis, MN About Blog The daily ups, downs, pains, joys, fears, hopes, failures, successes, frustrations, surprises, and even the blessings and beauty of living with RA and chronic pain. Facebook fans 817. Twitter followers 825. Naperville, IL About Blog RA Social Ambassador @RAHealthCentral, Self-care and rheumatoid arthritis advocate. Facebook fans 420. Twitter followers 544. Durham, NC About Blog Thoughts, stories, ramblings, and reflections on living with polyarticular juvenile rheumatoid arthritis in a world that expects me to walk and write a whole lot faster. About Blog Raising awareness of Thunder God Vine medicinal extracts, a natural alternative to conventional DMARDs in the management of autoimmune conditions. Facebook fans 32. Twitter followers 180. Norfolk, UK About Blog This is a blog about me, my recently diagnosed rheumatoid arthritis and my struggles to stay positive about it! About Blog A blog about Juvenile Rheumatoid Arthritis and daily life. About Blog We specialize in working with clients with rheumatoid arthritis find the highest quality protection at the best prices available. About Blog A blog about my life with rheumatoid arthritis and all that goes along with it. The ups and downs. The highs and lows. The laughter and the tears. 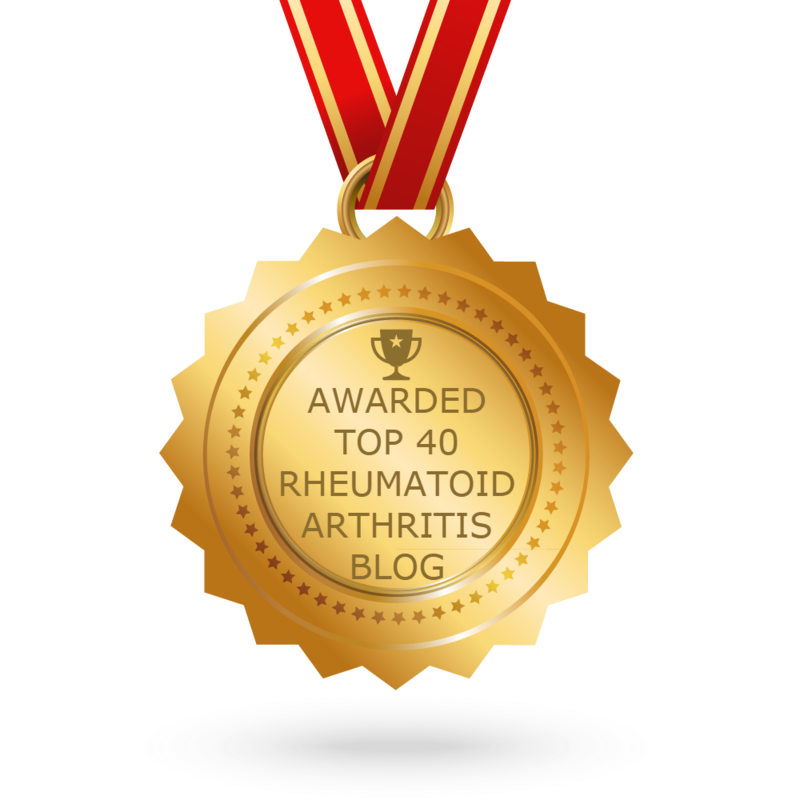 CONGRATULATIONS to every blogger that has made this Top Rheumatoid Arthritis Blogs list! This is the most comprehensive list of best Rheumatoid Arthritis blogs on the internet and I’m honoured to have you as part of this! I personally give you a high-five and want to thank you for your contribution to this world.